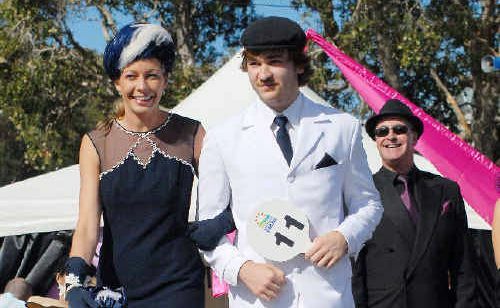 YVETTE Prewett took out the prize for best dressed woman in yesterday’s Fashions on the Field at the Coffs Harbour Gold Cup, repeating her 2008 success in the event. 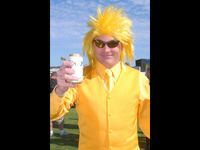 The Coffs Harbour hairstylist and businesswoman, who operates Aura Hair, said she bought her champagne-coloured Alex Perry suit from Coffs Harbour boutique Too Nice, teaming it with a hat from a Melbourne milliner, and Mollini shoes she found on the Gold Coast. Runner-up in the best-dressed stakes was Lisa Engel, who also took out second place in the best hat competition. Lisa, who made her own outfit, teamed a black satin pencil skirt with a swathed top in ballet pink and a black coin-spot net wrap. She used the same net in her feathered fascinator and on the trim for her shoes. 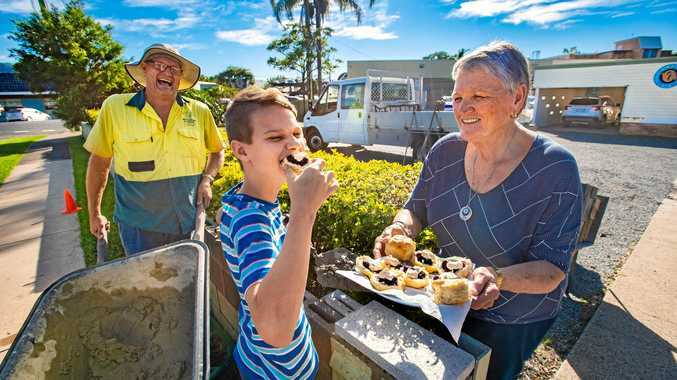 Third place went to last year’s winner, Laura Little, of Woolgoolga, in a vintage daisy-trimmed navy sheath she teamed with a blue-feathered pillbox hat. The prize for best hat went to Sydney-based Sharon Lenton, who made her own hat, a confection of black, white and pink sculpted sinamay waves anchored with a hot pink flower. Sharon teamed her dramatic hat with a black raw silk suit she restructured to have a 1950s feel. Wayne Welsh and Mim Flatt carried off the prize for best-dressed couple. Ms Flatt made her own outfit, teaming her black, gold and scarlet printed satin 1950s-style dress with a dashing red hat and a red satin handbag from the Bellingen markets. Wayne Welsh wore a black suit and a scarlet tie to match his partner’s dress. The couple sported matching red sunglasses from Bright Eyes at Park Beach Plaza. 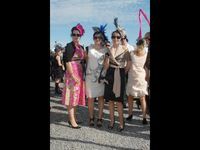 Judges had a difficult time sorting through a record field of entrants as women rushed to enter the popular Park Beach Plaza Fashions on the Field competition for the best-dressed woman. 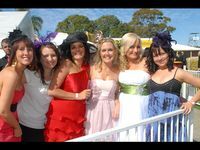 With more than 70 entrants, judges Debbie Gooley from the Bachrach Group of companies, ; Kay Skinner from Skinner Motors, Renee Frost from the Coffs Coast Advocate, and Claire Atkinson and Jenine Glenn from Coffs Harbour Racing Club, were forced to hold preliminary heats to narrow the field. Vintage outfits and 1950s revivals were prominent fashion themes yesterday.